The Basket of Dreams provides a meeting place, a resting place, a dreaming space. 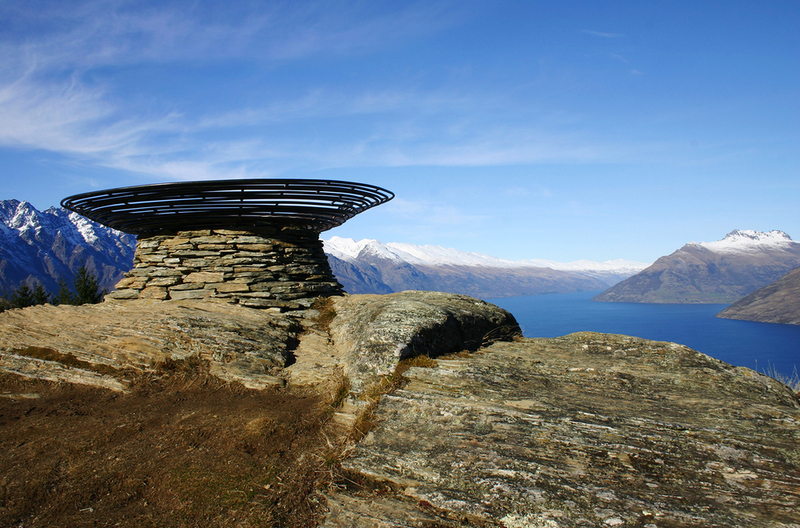 Situated near the high point of the Queenstown Hill walkway, the Basket was created for the Time Walk, Queenstown’s Millenium project which combines art, landscape and heritage to enhance the existing public walkway. ‘The Basket leaves you with a sense of belonging. It offers a real feeling of connection. It is a generous work and people really get that about it. Ah, the millenium: those elegant zeros, those extravagent fleeting midnight pyrotechnics, the parties to beat all parties. That might have been it, except for the human desire to make a personal mark, to commemorate the moment and leave a lasting legacy. Monuments were created all over the world including one as the destination of Time Walk, a heritage trail on Queenstown Hill, overlooking one of New Zealand’s stunning vistas in the South Island. However bored one might be about the millenium hype it is difficult to sustain any sense of that ennui around Caroline Robinson and her art. There is so much energy and exuberance expressed in her work. And it’s not just froth on top. Robinson is very professional about her art practice. Added to that is her considered content, a strong commitment to working cooperatively and a reputation for attention to artistic and contractual detail. Robinson’s work over the past decade has embraced wearable art, performance and installation art, costume and set design as well as sculptural works. While studying for a degree in sociology she established a label Cabal, making clothing to sell at markets and soon included theatre costumes in her repertoire. This expanded to supplying retail stores and galleries throughout New Zealand. She soon enjoyed a number of successes including several awards at the New Zealand Wearable Art Awards and some of her wearable art has been exhibited at Te Papa and Auckland Museum. She learnt about fabrics and dyes by trial and error, became adept in the medium and spent some time employed in this capacity in the film industry. Recently she has been designing a ‘Map Room’, an installation for mapping the arts industries as part of an Auckland arts employment strategy. 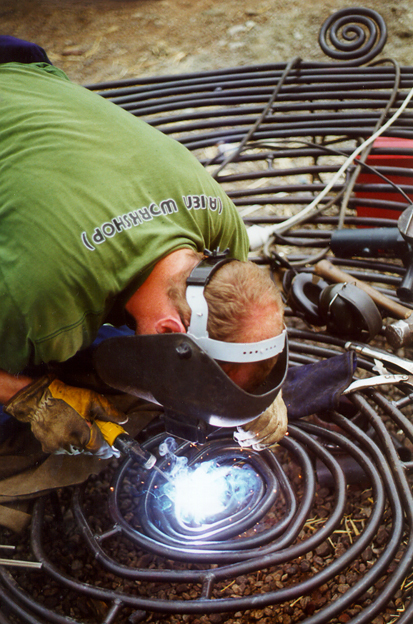 Involvement in the millenium project, which was created by mainly local designers and artisans, was no accident. 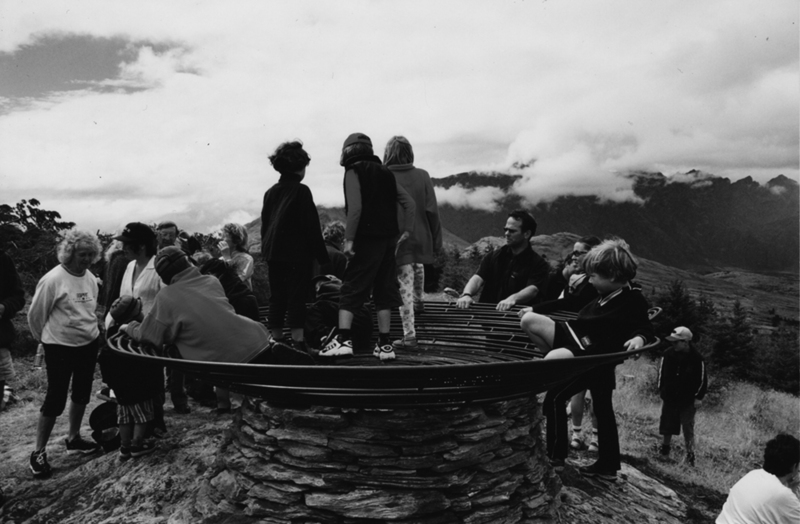 In July 1999 Robinson had created a temporary installation Glacial Memory: Tracings and Stories from Ice, Fire, Stone and the people of the Wakitipu as a centrepiece for the Queenstown Winter Festival. She has found that it was relatively easy to shift from dressing the body to the larger scale of dressing the environment, in this instance using ice, schist, fire, steel, lights and an old water pipe. It was an idea that she had successfully presented to the organisers and completed, with the aid of volunteers, on time and on budget, much to their, and the community’s delight. When the millenium project was being developed Robinson was invited to participate on the basis of that previous work, her enthusiasm for working collectively, her creativity and her professionalism. 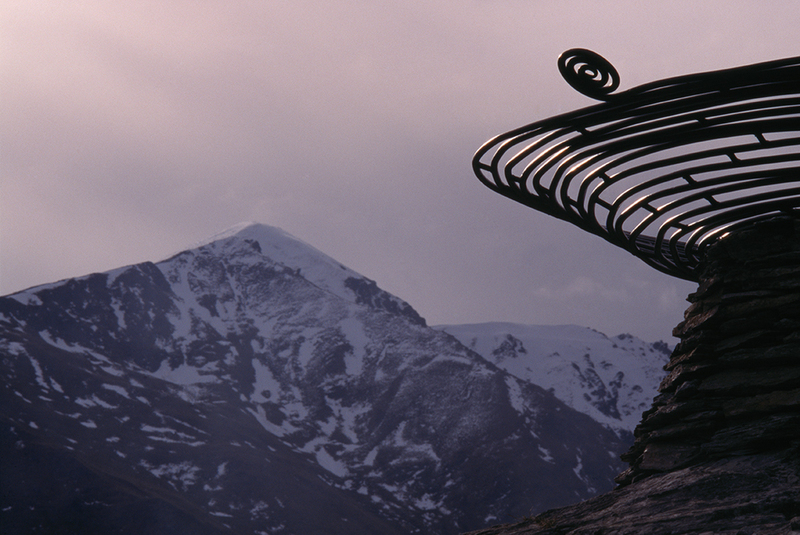 The Time Walk takes visitors through a wrought iron gate, along a heritage trail featuring history story panels on the ascent to views that encompass Lake Wakatipu, the Remarkables, Walter Peak, Ben Lomond and the alpine town of Queenstown. Funding came from several public and private sources including the Lion Foundation, Community Trust of Southland and the Lottery Grants Board, and volunteers contributed considerable labour and support. The project team comprised a landscape designer, a metalwork artist, a graphic designer, a stonemason and sculptor, Robinson. The geology and history of the area were strong influences on Robinson’s work. Love of the outdoors and inspiration from the natural environment are constants in Robinson’s work. She describes her role as that of a ‘biomimic, recreating and regenerating objects and materials in the same way other forces of nature evolve matter’ and continues to seek sustainable methods and materials for her work. 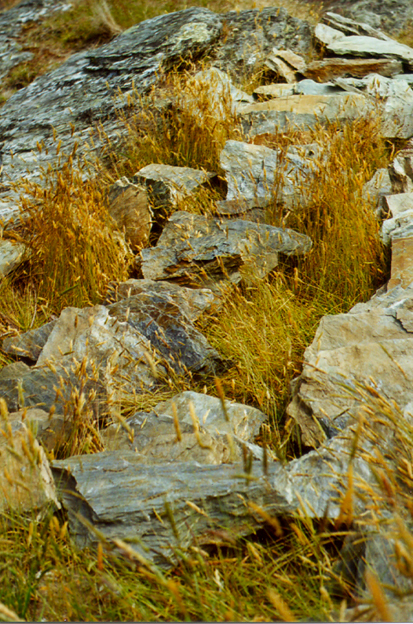 A dominant feature of the landscape is schist, some of which provided the foundation for the sculpture, to anchor it visually and physically and give it a sense of belonging to the landscape. The layers of schist echoed Robinson’s layered way of working as expressed in her concept sketches. 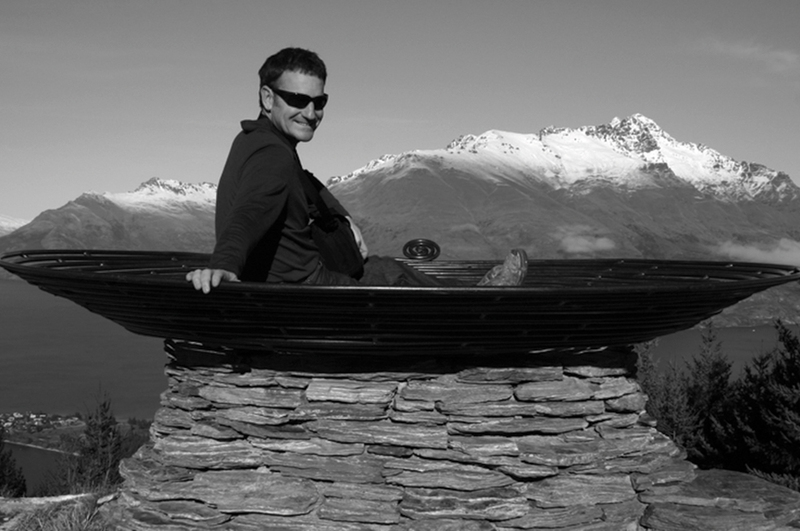 The form of a vessel emerged partly from seeking to relate the work to the Wakatipu basin that fills with melted glaciers. The glaciers, the holders of memory in the form of weather patterns, inspired the metaphor of ‘history pouring into and emerging from the vessel’. Developing preliminary concepts, prior to each participant embarking on individual aspects, was a collaborative process. The concept of time was part of the brief and for Robinson it was about the future, expressed by the phrase ‘time flies, eternity awaits’. Coincidentally the spiral and concentric circles appeared in each of the project team members’ early ideas and both ideas were retained. 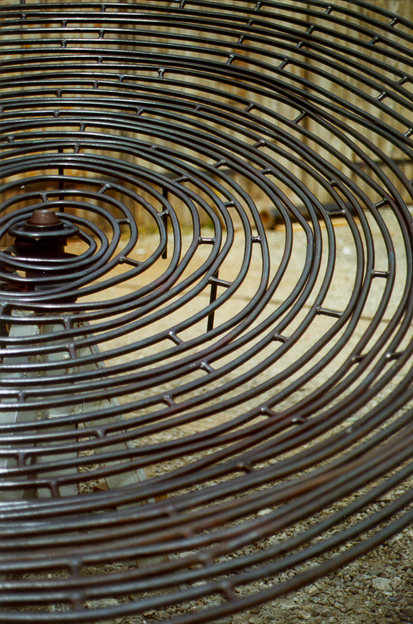 Concentric circles became part of the graphic imagery on the information panels and spiral motifs featured on the gate at the entry to the walk. The sculptural focus of the walk became Basket of Dreams, an organic vessel formed by a continuous spiral of welded solid 20mm steel rod, expressing never-ending time. To express new growth of the future Robinson completed the large spiral with a reverse small spiral. The small spiral evokes an unfurling fern frond - the new growth of the future. It was tempting to seek relationships between Robinson’s strongly personalised constumed ‘characters’ which are full of narrative, emotion and crafting skills, and this sculptural work. 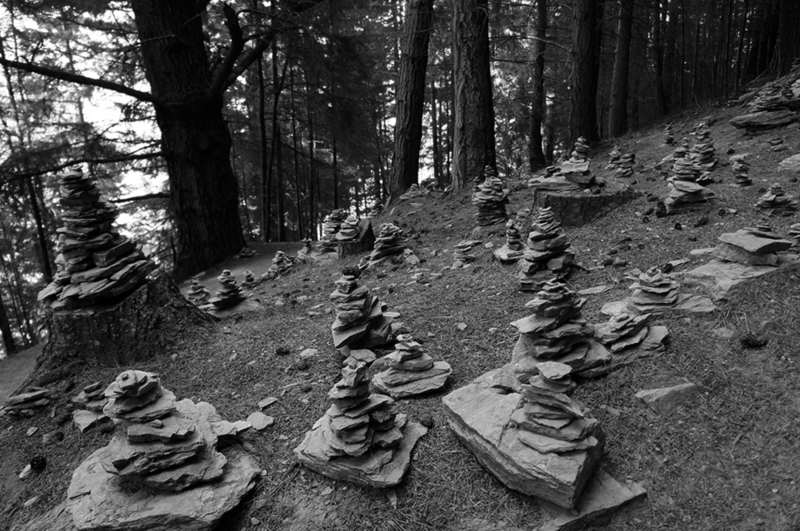 ‘Dressing the landscape’ was how Robinson explained her temporary installations and immediately a relationship between the projects became comprehensible. 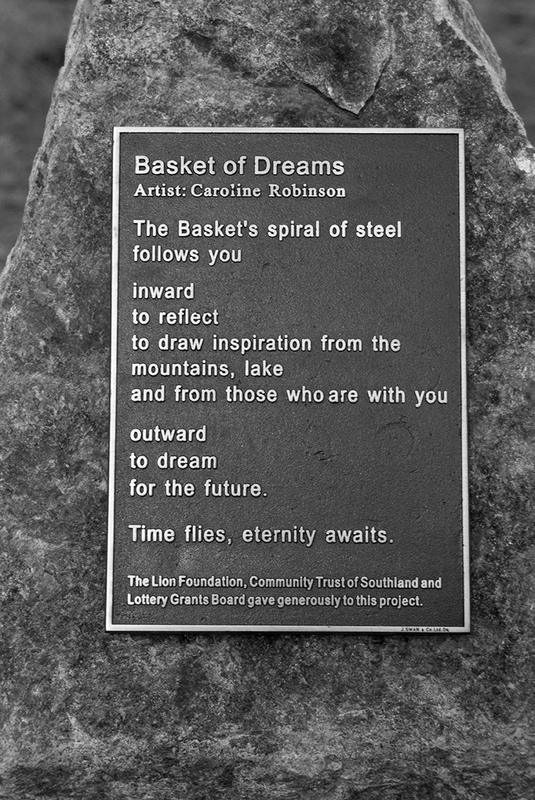 But there is a significant philosophical shift with Basket of Dreams, which is a permanent public work. It, too, draws on narrative, emotion and crafting. Establishing enduring values becomes significant. The dialogue about the physical, social and historical context has considerable importance and the aesthetic qualities of a high impact, temporary installation are, of necessity, different from a work with a long, visible life. 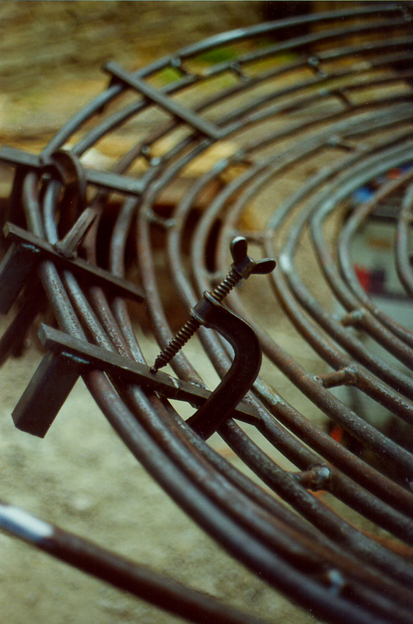 The leap from textile to large scale steel sculpture is also interesting. It becomes possible to make links between structures designed to support sculptural garments and the structure as being important in its own right. To instal the Basket of Dreams there was the excitement of having the sculpture flown in by helicopter. As with many of her larger projects there was the shift from physical creation to managing a collective process. Robinson has learnt to relinquish some, but not all, of the physically demanding aspects, in contrast to personal involvement with every minute detail of her wearable art. And she has retained a fibre sensibility - the steel ‘thread’ viewed against the blue sky is as sinuous and expressive as the silkiest of sewing threads. Author, Helen Schamroth is a mixed media artist working from a textile background, a writer and curator. 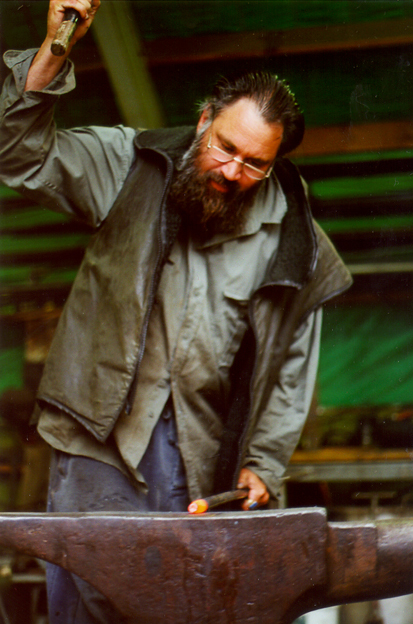 Her book ‘100 New Zealand Craft Artists’ won two Montana Book Awards in 1999. She was recently appointed to the Arts Board of Creative New Zealand.